Used on a Pro-ject Debut Carbon Esprit DC. Detailed and well-defined sound. Good bass response. Compared to Denon DL-110: Lacking midrange. Harsh treble. IGD. The sound is not as natural an life-like. Ohhhh the bass is fantastic. The tracking is superb and it excellently tracks inner grooves with very little to no IGD. Very musical and detailed cartridge and as usual with Ortofon it was easy to setup and install. Within half an hour I was listening. Very good value for money considering you can pay thousands for cartridges. Better than expected but still have yet to fully run it in. A great next step up for any hi-fi enthusiast. Exceptional value for money. Super. The only cartridges I listened to that I think sounded better is Ortofon 2M Black and ADC XLM Mk III (with original Shibata stylus). And the difference is not that big. If you have a budget cartridge like AT 95, Shure M75, or others of that cind. Run to the shop, buy this an instal it on your turntable. You will not regret it. Prior to using the Ortofon 2M Blue I was using a Sumiko Pearl, even though it was a good entry level mm cartridge it was ok, tad to warm for my taste. After reading reviews on the 2M blue I decided to give it try. It was like a veil being lifted in comparison to my previous cartridge, absolutely musically better, more dynamic, better soundstage. Some say its too clinical, cold even. I have to disagree as I think it really comes down to your setup, turntable, amp, phono stage, speakers etc etc. What the Ortofon 2M Blue can do is really showcase your equipment or where a part of your equipement maybe lacking, I do have to agree with others that the cartridge is very neutral, an example I did was try 2 different phono preamps, one had given more bass the other was more balanced musically, faster and tighter. If you trust your equipment to do its job well for you then the best will ony come from the 2M blue, lets face it, its not the most expensive cartridge but I will garantee it will deliver great music, trust your ears. I upgraded from the 2mm Red to the 2mm Blue because I read some positive reviews and thought it might be worth it. The Blue exceeded my expectation in every way and does everything better than the 2mm read. I agree what with virtually every word that was written in the lengthy but in my opinion accurate review by mvm below so no need to repeat all of that. Let me just ad that it takes effort to pull myself away from my system since I've had this cartridge. I own more expensive MCs as well, but I rather listen to this humble Ortofon instead. I have heard some people describe it as cool or not as warm as others, perhaps that's true but true my system is has plenty of warmth. As some have mentioned it has great bass, but it's the sweet midrange and shear musicality that I like the best. I have had no problems with humming due to antiskating issues. For the money (less than half of some of my MCs) this is an amazing value. If people aren't absolutely thrilled with this cartridge then perhaps the issue isn't the cartridge. Highly recommended. Luxman CD player, B&W N803 speakers, Nakamichi Dragon Cassette Deck. The 2M Blue is not my favourite one, but it is a good one. I use it on a Rega Planar 2 turntable with a J.A. Michell Tecnoarm. The Ortofon 2M Blue is neither romantic nor warm, so if you are looking for a warm one, you should buy something else such as Ortofon MC1 Turbo, Shure m97xe or Grado Prestige Silver. The main qualities of the 2M Blue are dynamism, excellent tracking and deep bass. The high frequencies and the mid band are not my cup of tea; however, the 2M Blue is not bad in these areas. In my opinion, the Denon DL-110 performs better in these two ranges of frequencies because the midrange is more enjoyable and the high frequencies are airier. The 2M Blue is a perfect match with a system which lacks of life and is mainly on the warm side. Finally, the 2M Blue has more surface noise compared to the Denon DL-110. 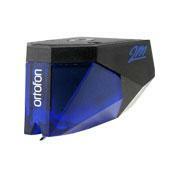 Overall, the Ortofon 2M Blue is a good cartridge if it is match with the right stuff. Recommended. This is the first review of Ortofon's 2m Blue, so it'll take a bit long. I waited two weeks before posting down this review, in order not to get wrong impressions of a product that hadn't been thoroughly run in, but now I notice no variations in sound quality, so I think it's time someone did justice to this marvellous product. The 2m Blue is the second cheapest in the range, but actually there's nothing «cheap» about it. Even packaging is impressive, albeit in a 80's kind of sci-fi presentation. The cartridge compounds of a black chassis and a detachable translucent blue body, both shaped to emulate the angles of a diamond - or is it a stealth aircraft? Anyway, this is an impressive cartridge, especially when mounted on the tonearm. By the way, mounting this cartridge is a 10-minute affair: the body has threaded mounting holes, so there's no fiddling with patience-consumming tricky minuscule nuts. I aligned it with two products I'd like to recommend for their low price and genious simplicity: the Ortofon protractor, which sells for €5 (approximately $7), and the Clearaudio Smart Gauge (€14). Alignment for overhang on a Rega RB series is very easy, as the cartridge's shape is similar to the tonearm's headshell, so it is only a matter of fine tuning. To mount it, there's a useful recommendation in the Ortofon booklet: mount the cartridge in such way that the stylus fits 16mm ahead of the spindle. Also note that Rega tonearms will need a 2mm spacer, as the 2m's body is quite tall. On the other hand, this is a cartridge that will make you rethink your conceptions about antiskating: it needs to be very carefully tuned, or else buzzing in some high-speed transients (e.g. electric piano arpeggios) will appear. Too much antiskating, and the buzzing will be heard on the left channel; too little and you'll get it on your right speaker. You won't need to get neurotic about aligning this cartridge: I got it spot-on at the first attempt. All other experiences I made only degraded sound quality. Once properly mounted, this cartridge rewards with a very energetic, engaging sound. First thing that will strike you is the bass. It is a thoroughly modern bass: powerful, fast and articulate. Not "tight" in audiophile fashion, but floor-shaking and absolutely delightful to listen to. It has the ability to make your walls vibrate - and yet you can hear all the notes and their modulation with incredible lucidity. As a matter of fact, I'd say bass is its main strength: it is fully developed and exquisitely detailed, making for a very involving listening experience. The midband is also phenomenal, with lots of presence and detail. It is tonally very neutral, yet it has a unique way to make vocal and solo performances come to the fore. Besides, there's an incredible "hear-through" feeling that makes dense mixes a delight to listen to; in orchestral music, you are very aware of the musicians' location in the studio or hall, but all this separation doesn't equate to a vague, diffused presentation: one of the main strengths of the 2m Blue is its wonderful consistency. Music sounds entirely coherent, not hazy or ethereal as in some «audiophile» products that show the parts rather than the whole. Here you can listen to the music in an integrated, consistent way - yet you'll be amazed with the ambience it retrieves from the LP. Besides, this is a very fast-paced cartridge. Timing is spot-on and transients are played with incredible speed and energy. So much, in fact, that it betters (at least in this respect) every other cartridge I've had. So, music sounds meaty and muscular - which happens to be the way I like it. You see, I gave up trying to be an «audiophile». My prime concern is the music, not the means to reproduce it. I don't care for ticking boxes from the audiophile checkbook: I want to have fun and enjoy myself with my LP collection. Life's too short for neurosis-inducing hi-fi magazines and high-end advocates. And yet the Ortofon m2 Blue gives me everything I could expect at this modest price. It is fun to listen to, making dance music sound vital with its pumping bass, yet it has the pransparency and neutrality needed to enjoy a classical or jazz recording (by the way, the most satisfying listening experience I had this far was Charles Mingus "Blues & Roots" LP. God, how I love Pepper Adams' Baritone sax!). So is it perfect? No. Of course it isn't. For instance, the treble doesn't have the exhilarating extension of the now discontinued Ortofon MC 15 Super II. Maurizio Pollini sounds as if he'd torn up his contract with Steinway & Sons and signed with Bösendorfer instead. It can sound glassy with some thin-sounding records (Groove Armada's "Vertigo" comes to mind), and tracking of some transients can be an issue if you don't be careful and patient with antiskating regulation. But its strengths overcome these issues. Frankly, you get all the treble extension you need - with the bonus of smooth, clean and non-fatiguing sound. And you don't have as much noise as with mc's. You'll never capture CB emissions with this cartridge! And absolute tracking is actually quite good. Here is a cartridge that delves deep into the groove, without skipping ou mistracking even on difficult, compressed LP's such as Waldeck's "The Night Garden". The 2m Blue is a terrific cartridge. It sounds big, generous and entertaining, yet it retrieves every bit of information on the LP. And it has bass to die for. It is never fazed by any kind of music, be it Brahms, Pixies or Miles Davis. It has the qualities of a good mc cartridge without the fuss and the nervousness. I recommend it to all music lovers who cherish their record collection and want to enjoy it in style for not so much money. My equipment: Rega Planet CD player, Rega Planar 3/RB 300, Musical Fidelity X-LP, Primare A20 MkII, ProAc Tablette 50, all cables by Kimber.